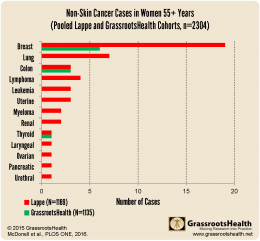 In April 2016 GrassrootsHealth published a paper on vitamin D levels and all non-skin cancers. This paper used data from two different groups – one from a randomized controlled trial (RCT) and one from a subset of our D*action and Breast Cancer Prevention projects. A summary of this paper is here. This combined data set, with 2,304 women aged over 55 years and older, was relatively balanced between the two groups – 1,135 from D*action and 1,169 from the RCT. The median vitamin D levels, however, were not similar. The D*action group had a median level of 48 ng/ml (within our recommended range!) and the RCT group had a median of 30 ng/ml (which is higher than the US average of 25 ng/ml). Also different was the number of lung cancer cases, although it was not statistically significant (p = 0.11). 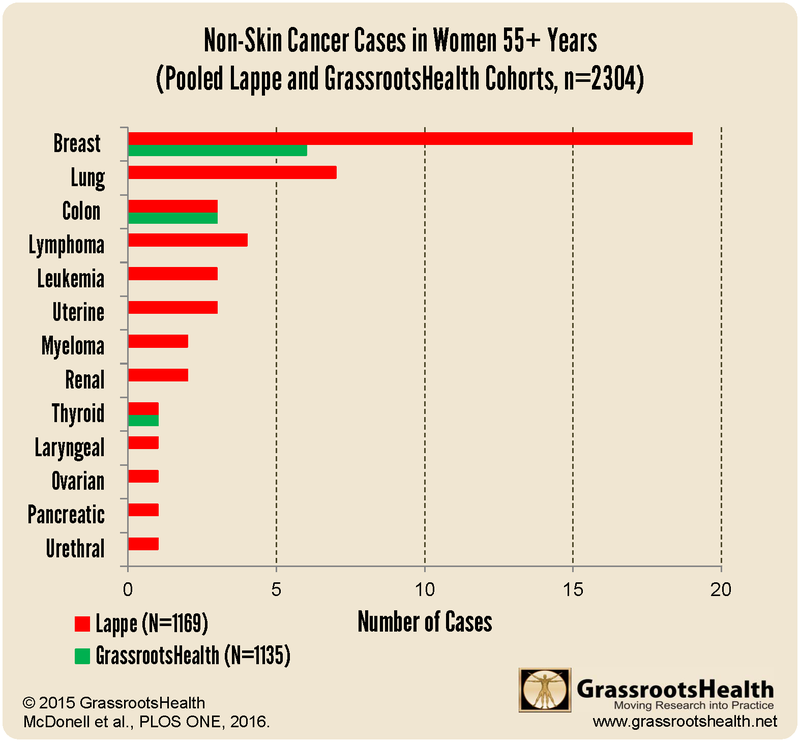 The D*action group had zero lung cancer cases and the RCT group had seven. This seems to be consistent with the hypothesis that vitamin D levels in recommended ranges (40-60 ng/ml) will reduce lung cancer incidence and that the higher the vitamin D level, the less likely you will be to get lung cancer. Data from Tretli et al. followed 210 lung cancer patients for up to 18 years. Survival length was mapped with respect to vitamin D levels. Those with the highest vitamin D levels had the longest survival rates and the difference between the highest and lowest groups was dramatic.